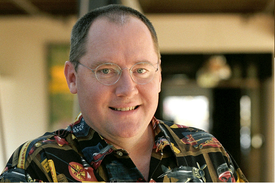 Although best known for creating Toy Story, John Lasseter is far more than a writer or director: he's the chief creative officer for Disney and Pixar, the man responsible for shepherding both studios through the last several years' huge successes. His very full plate makes it interesting that he'd make time to direct Cars 2—his first time at the helm since 2006's Cars, and only his second gig in a decade. The choices makes Cars 2 feel like an oddly personal and intimate effort, despite the fact that the first film earned more than $1 billion in revenues. Boxoffice sat down with Lasseter to reflect on Pixar's 25 year anniversary, talk about Pixar's curious new emphasis on sequels, and answer a big biological question: how can a Car have a mom? Joe Ranft, your longtime creative partner and co-director and writer on the first Cars, died in 2005 before the movie was released. How was it go back to the same characters without your wingman? It was rough. It's been rough ever since, to be honest. Joe was such an important part of my life and was like my best friend and right hand man—a true wingman. It was just sad to lose him, and it was right after we lost him that Disney bought Pixar and we merged with Disney. In all my time at Disney, I just keep saying to myself, "My god, Joe would just love this." He loved helping people. He loved teaching people. He was such a great support for everybody, you know. I think of him everyday and my background of my computer is a great picture of him and my youngest son Jackson when he was really little. Jackson was putting tiny little fingers behind Joe's head and Joe was posing right next to the Heimlich ride at A Bug's Land. So I think of him every day. I was thinking of him all through this because Joe, in a big part, is Mater. He's missed and he's all over Cars 2. You guys built something pretty solid with your story department. That seems to be the bedrock of this movie, and of Pixar in general. Story is the most important thing for us. Period. In our films. Period. And getting the story department really solid with brilliant, experienced people-they're the ones who roll up their sleeves and just keep hammering away at the story. It's a long, hard journey for every film: working and reworking, working and reworking stuff. It's a group effort, it's very collaborative. Joe was a big part of building that. When Pixar hit rough times in the '80s, did you think this all was possible? I mean, I don't have a crystal ball. I just always wanted to make great movies and entertain people and I love computer animation. It was so much fun working at a place that's developing. It was really, really fun to be able to just invent new things and be a part of this group that's building and inventing computer animation, doing the first computer animated feature film. Staying totally focused on the story and the characters, and that's something that I learned from Frank Thomans and Ollie Johnston and all my teachers and mentors at Disney. So often, people get so seduced by technology they lose sight of the fact that technology never entertains an audience. After the enormous merchandising success of Cars, making a sequel seemed as much about a financial responsibility as a creative continuation. Was there hesitation about making a sequel over another original project? It's funny, everybody has this thought that Pixar's changing. What happened is, we're a separate company—we had a five-picture deal with Disney. In that five-picture deal, sequels did not count. So we did Toy Story 2 early on because, originally, it was going direct-to-video. That was back in the day when the first direct-to-video was Aladdin. That was kind of the business model everyone was looking at. For us, it's always about making great movies whether it's a sequel or not. You develop a great story with great characters in a believable world and when it's over, it's like these characters are friends of yours and it's a world you want to go back in and revisit. And it's about coming up with new stories. But during the time of this deal, the five movies had to be original to count. And the company didn't want to put any effort into something that's not going to count for ticking off those five pictures, so that's why we focused on that. It wasn't that we didn't want to do sequels—we just couldn't, right? Then what happened is the relationship between Disney and Pixar started to get fractured. Pixar decided we were going to do a deal with somebody else, not Disney. Disney basically took the sequel rights to all of our characters, contractually, away from us and they were going to be setting up another studio down here just to do the Pixar sequels, so it was rough during that time. Then five years ago when Disney bought Pixar, it made a new creative offset: it threw the negotiation into discussion. The number one thing was to give our characters back to us so we could do the sequels we always wanted to make. It takes four years to make a movie, so four years ago as soon as it happened, we started on Toy Story 3. And then Cars came out and Cars was a big success, so in 2007 they started talking about the idea of us doing that. We had all these ideas lined up and wanted to do the sequels without interrupting our flow of original films. We had slowly grown over 10 years to be able to do a movie a year. We don't expand overnight because some people are like, "Oh, let's start making a lot more movies," and their quality drops. For us, it's about growing without a change in quality. It really took about 10 years to do it. With adding sequels into it, we didn't want to start or interrupt the original movies we had lined up to go. So we expanded just slightly and expanded our production so instead of doing a movie a year, we're doing three movies in two years. We still have the original movies going uninterrupted, and then every other year we can do another movie that would be a sequel. Then we can kind of get shifted around if some stories are having trouble. Things got lined up a little out of order because we have two sequels in a row, and then we have an original movie next year, and then another sequel. It kind of shows we have this pent-up desire to do sequels, but it's not really going to interrupt the original movies. In Cars 2, you mention the existence of dinosaurs. Are those dinosaurs flesh and blood or are they cars? And further, do you have to vet those sorts of references that may introduce a different aspect to the series' mythology? I mean, in the mythology of the Cars world, the living creatures are vehicles of some kind, and so it's like with dinosaurs. I always imagined it would be some kind of dinosaur-like car or vehicle, something like that. It would actually be an animal. And whether it would actually go down in the earth's crust and get smushed and actually make a fossil fuel, I don't know—we don't go kind of that deep into the mythology of the world. You kind of touch upon it with the cow-tipping, where dump trucks are sort of the bovine class of the Cars universe. Yeah, I was driving across Nevada at one point and I was driving by myself. My family and I, we had stayed out on vacation too long, and they had to get back for school, so I just put them on an airplane and said I'll drive home. And I was driving across Nevada—and the loneliest road in America was just really fun—and I looked across at this dump truck and thought to myself, "That's a long way away!" And I realized, "Oh, that's one of those huge guys!" It was at some mine or something, and I realized how gigantic this thing was, and it was like, "That's kind of fun." Because there is a tacit acceptance of "car-ifying" everything in this world, how do you make sure you don't violate its rules? I'm pretty adamant about sticking with that. We don't really have animals within this world. I like the idea that there are some-in the same way that we have intelligent beings and then animals that have brains and stuff but they're still animals. And I sort of think with the tractors, we established that there are certain types of vehicles that are just more like animals and stuff, and we find that sort of funny. And then there are insects, the tiny little flying bugs, so we've tapped into that world. I think that's really fun, to take it and expand the world of the living creatures all being machines. So we stick to that. I originally had the idea that there's no parents and kids because cars are manufactured-there's no having babies in this world. But we did tap into that because I wanted to show Francesco Bernoulli's mother as an old Formula-1 car. I don't know—maybe he's adopted. But we did go there a little bit with just that. But I'm aware of these kind of rules. And the dinosaur thing is just a funny line. We figure that if someone really wants to see it, we can figure out what a dinosaur in this world was or looks like. In real life, Tokyo is already a digital cartoon. How fun was it to put it in a digital cartoon? This movie was so much fun to make. It was really fun for all of us and part of it was choosing to go around the world and coming up with the car versions of these cities. One of the things I've always loved about Japan—Tokyo's one of my favorite places in the world—is it's crazy. It's high tech, crazy traditional, really old traditional, like boom side by side. When you go to Paris, it's beautiful there but they kept the modern world out on the outskirts. It's like they protect it—it's Paris, it's naturally fun. But in Tokyo, there's a temple right next to this modern stuff and neon lights and huge video screens. It's just music and sound, just beautiful and really cool. Italy was really fun because all of these are my favorite places. I just love Italy. It's amazing the look of trying to get the car parts in all the old Italian village—and in London, which I love, too. Creating the car-ification of that was one of the really fun parts of this movie and I think it shows that our team had so much fun. That's why there's so much of it in there. It's big. This movie is so much more complex and big than any of the other films that we've created. Audiences seem to have cooled a little bit on 3D, particularly in the last three months with the report of Pirates selling more tickets in 2D than 3D. But with animation, you guys have always had enormous success in both 3D and 2D. Are you making decisions about will be in 3D going forward? Everything. Everything in 3D. I love 3D. I've always loved 3D and I've always wanted to do our movies in 3D because we're developing within the computer worlds our 3D. But our technique is 3D. First and foremost, the story's the most important thing. Whether you watch it in 2D or 3D, it's about telling a great story. I love 3D, I think it's really cool, we make our films with 3D in mind. It's not the dominant thing-it's like computer animation, and computer animation doesn't entertain audiences. 3D by itself doesn't entertain audiences, but I think you can enhance the feeling. What we tend to do with our 3D is just pull you in to the movie a little bit more. In Cars 2, I designed all sorts of stuff with 3D in mind, but most obviously is Holley's screen that comes up and it's a holographic thing you can see through. I always knew it would be really kind of cool. Do you think at all about market-driven changes? No, luckily I don't. I'm the chief creative officer and my job is to make and oversee and help the directors make their movies awesome. That's my job and right now we're making all of our films in 3D because we want to and it's really fun.